How Technology Is Transforming Government. Technology is helping to transform government. This statement probably washes over you like a fine wintery mist, before evaporating into nothingness, because you’ve heard something similar so many times before. Every industry you can think of is being moulded by emerging technologies. That’s no groundbreaking admission. But GovTech, a fancy acronym for technological solutions provided to government by external innovators, is here to save the government from stagnation and shake up the services they provide. There are simply too many to ignore. PUBLIC put together a report, The European 150, to celebrate some of the 2,000 GovTech startups in Europe alone. To put that into cash money figures, spending on GovTech in Europe is €21.8bn; and that could grow five-times over in the years to come. From IoT smart road systems, to speech recognition software and agriculture mico-satellites, startups across the continent are supporting citizens where governments fall short. “‘The European 150’ highlights the startups across Europe blazing a trail in the GovTech landscape,” Korski explains. “The report features fifteen European cities and ten GovTech startups within each that are set to transform the way the public sector in Europe operates.” Why? Because “More and more European nations are looking to ‘GovTech’ startups to solve their most pressing challenges - and more and more startups are surfacing to meet these requirements,” Korski added. Of course, it’s naive to think that startups are a magic pill to fix systematic problems that are limiting public services. A successful startup needs funding, accessibility, time and a vision that puts people before profits or commercial interests. That's a lot to consider. So let’s start with the basics. GovTech primarily refers to a growing movement of startups looking to transform public services through technology. 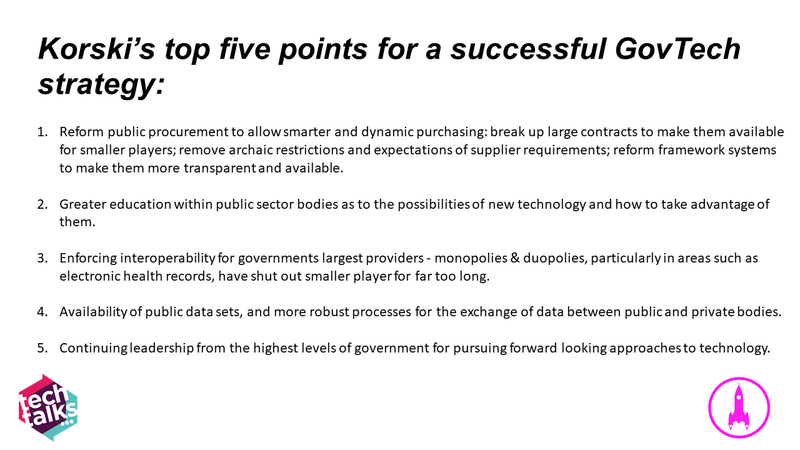 Increasingly, Korski adds, GovTech is being used as a by-word for a new era of government technology - one marked out by smart purchasing and procurement - a successor to ‘e-Government’ (a by-word for large incumbents supplying technology to government), and ‘Digital Government’ (governments creating tech in-house - GDS, for example). Korski believes GovTech holds a means to meet these challenges. How? Tech can help build cheaper, more user-friendly services for citizens, transforming everything from how individuals access healthcare to how courts simplify expensive and time-consuming paperwork. With the NHS teetering on a knife edge above privatisation, government cuts are becoming the norm. Just last December, funding for public health services like sexual health clinics and mother and baby support was cut by £85m. In order to support growing demand under austerity, doctor surgeries are offering appointments over the phone, and mental health waiting lists are quietly increasing. And yet, healthcare professionals often have to rely on archaic technologies that slow them down or lead to confusion. Over 6,000 doctors and nurses are currently using the Forward app across over 100 UK hospitals. It's saving them on average 30-45 minutes a day, speeding up waiting times and allowing them more time with patients. The effectiveness of the Forward app comes with its simplicity. When we praise tech, we tend to be attracted to the complex and mistake it for being innovative. Much like a moth is drawn to a flame. But sometimes, that's not necessary. Sometimes, the application of the tech is much more important. We all use a messaging app every day, but this relatively straightforward software could rejuvenate how doctors talk to each other. Without sounding too much like a anti-establishment campaign, successful GovTech relies on grassroot change and empowering people. Forward isn't the only startup pushing for grassroots change. Umbrellium CEO Usman Haque and Senior Designer Ling Tan have been experimenting with the idea of using wearable technology to tackle air pollution. The pair have been workshopping with over 200 people across two years. They sent participants out with trackers into their local area, and told them to make specific gestures when they felt that the air was especially polluted, such as putting their hand up to their nose or covering their mouth. The wearables measured these movements. “So the humans are kind of the sensors themselves,” Hague suggests. Hague and Tan would also take a calibrated air quality sensor out with them during these workshops, and combine that with geo-location tracking and a machine learning algorithm. Human perceptions are then compared to the machine data; to see if those gestures predict the value of the air quality sensor. It helps residents to feel powerful against something as vast and scary as pollution. But that’s not all. Humans can be more perceptive than a machine. Consider London for a minute. A heavily populated city where greenery is shoved and slotted wherever it can fit; which is why you end up with parks appearing on roadside junctions. These areas of ‘uncertainty’ cause confusion in the air quality workshops. Teaching residents to have a sense of agency is a worthy cause, but policy makers are the ones that can enact real change. Hague told me that this project can help local authorities to identify where sensors need to be installed. Moving forward, the Umbrellium team are hoping to train more community partners to take on this toolkit and roll it out in their city or neighbourhood. “Not only Umbrellium can do this, anyone who is interested can do it in their own city, just by taking the tech and engagement methods,” Tan concluded. Governments aren’t just facing a tech drought and running low on funds, they are becoming less trusted, Scott argues. “This makes it harder to attract and retain the talent it urgently needs to adapt to emerging technologies and solve increasingly complex problems,” she continued. The government may well control about 40% of the world’s GDP, but millennials tend to see startups as the best way to make an impact on society. With the Silicon Valley motto “move fast and break things” in mind, it's no wonder that startups, with their young hungry entrepreneurs, clever tech and big dreams, are the talisman for innovation when compared with notoriously slow moving government offices. “Bureaucratic procurement systems also make it hard for government to work with innovative startups offering more effective and citizen-centric technologies,” Scott added. This needs to change. But how? “Government needs to have a goldilocks level of in-house technical capacity - enough to do what’s necessary and to hold private sector contractors to account, but not so much that it ends up trying to do things that would be better done in more agile organisations,” Scott suggests. She hopes that Apolitical can be the platform to make this happen. Just two years after launching, Apolitical is used by mayors, ministers and other public servants across 140 countries. The platform offers policy solutions spanning innovative refugee integration ideas through to how to think about ethical AI in public services. As the UK faces such an uncertain political future, governments need to, simply put, take all the help they can get. This is not about startups taking up the slack; it’s essential that governments and startups collaborate, and exploit each others strengths to be as effective as possible. Startups can head up the innovation, produce the flashy tech and top talent; then the government can finetune the strategy and implement it. But they both need to do what’s traditionally unthinkable in business; put people before profits.